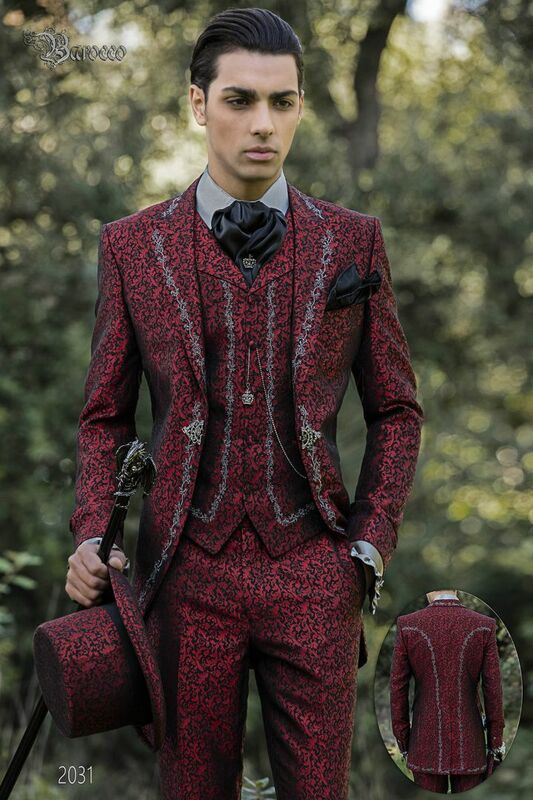 Red jacquard brocade italian bespoke groom suit with silvered embroidery on the front side and the back side. Peak lapel... Red jacquard brocade italian bespoke groom suit with silvered embroidery on the front side and the back side. Peak lapel, one vent at back, Redingote-style seams and rhinestone frog closure. Shirt made grey satin with standard collar. Ruffles along the placket and cuffs. Exposed placket with black diamante em... Shirt made grey satin with standard collar. Ruffles along the placket and cuffs. Exposed placket with black diamante embellished buttons. Convertible cuffs with black diamante embellished button. Baroque-style gunmetal grey rectangular cufflinks with smoky grey jewel and diamante embellishment. Gunmetal grey crown tie pin with smoky grey diamante embellishment. Protective cap.